Hello everyone and welcome to my blog today. You are visiting Kayla MacAulay's blog from Tasmania, Australia. Today along with the rest of the Artisan Design Team we are sharing some projects that we have made with the Beautiful Promenade suite of products. 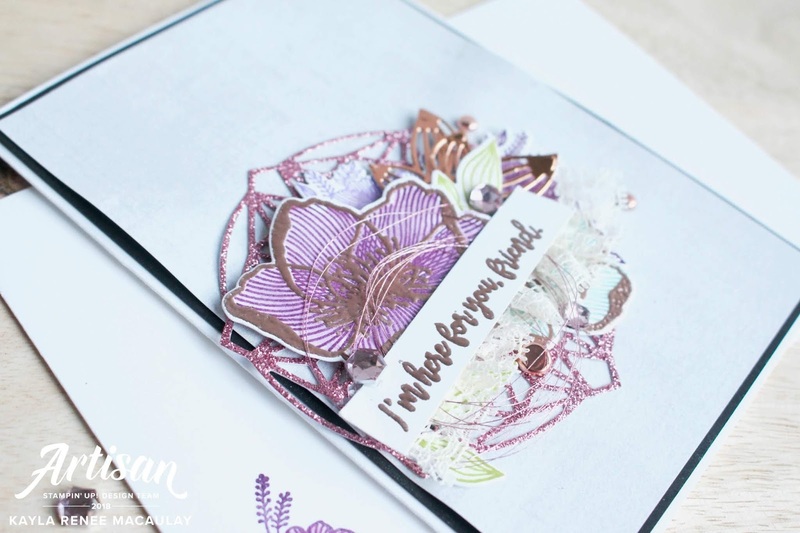 I fell in love with the layering possibilities from the gorgeous stamp set in this collection (see below for linked products) and fell in love with embossing the outer stamped layer with metallic embossing powder and that's where the inspiration for these projects came from. Combined with our really super fun Baker's Boxes (which I still can't part with or decide what to put in) I really loved making this beautiful gift set for someone special. I hope you enjoy and find some inspiration in this blog hop. See below for links to the rest of the Artisan Design Team Blogs. 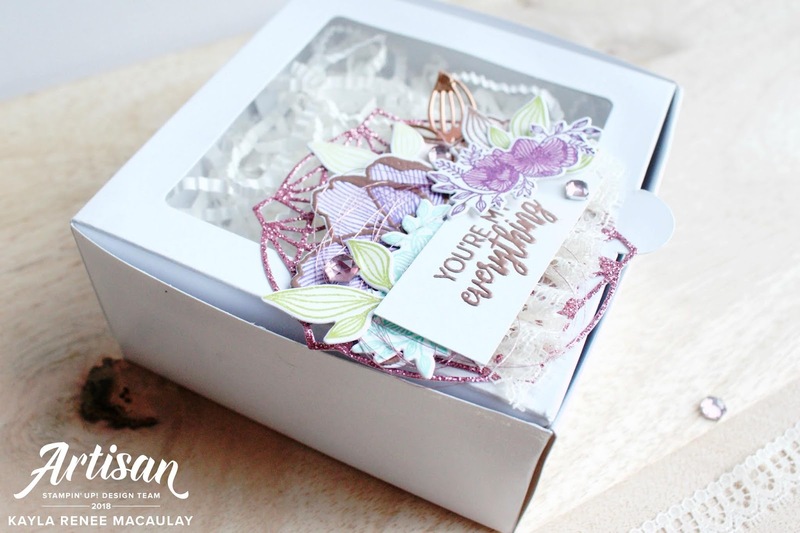 Here's a look at my completed gift set, a combination of a standard sized handmade card and a decorated Baker's Box. I really loved combining the beautiful Rose Glimmer Paper with the Copper tones from the Foil paper, Copper Metallic Brads and Rose Metallic Thread. There is a whole lot of metallic going on in this projects and I just love it. I also found a new love for the beautiful Pink Rhinestone Gems, which allow you to use something a bit different as they aren't circular in shape but instead a variety of other fun shapes! 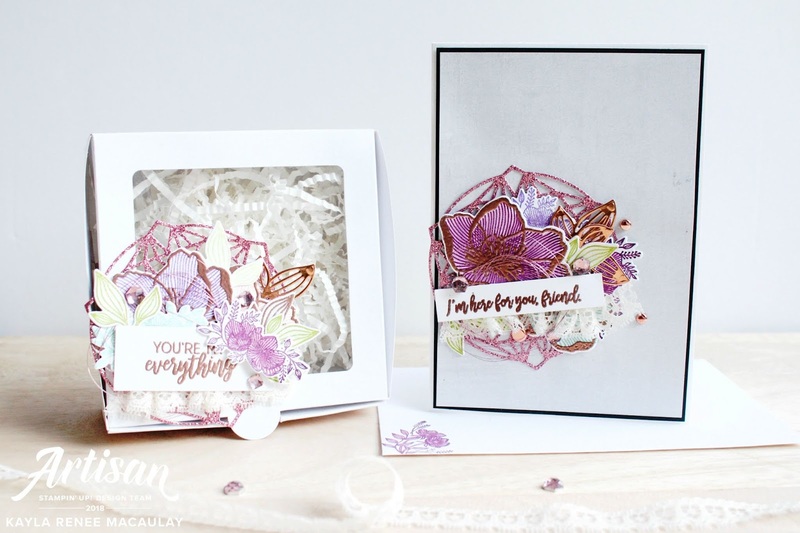 I used one of the more subtle backgrounds from the Petal Promenade Designer Series Paper that reminded me of a Stone Washed background and really liked the basic but textured background it provided. Here's a look at the finished card on it's own. I had fun combining a fun variety of colours such as Gorgeous Grape, Highland Heather, Lemon Lime Twist and Coastal Cabana. I have become a total lover of PURPLE now that these new purples have been introduced to the colour families. Here's a close up of the finished card. I couldn't decide what to add as a finishing touch but decided on the Very Vanilla Lace Trim as it adds just that little bit of subtle texture and a neutral colour and I love how it turned out. And a bit of a close up look at the finished Bakers Box decorated. I replicated the look I went for on the card, adding a couple more bits here and there and a different sentiment. I really hope the person that I gift this to will love it as much as I do. 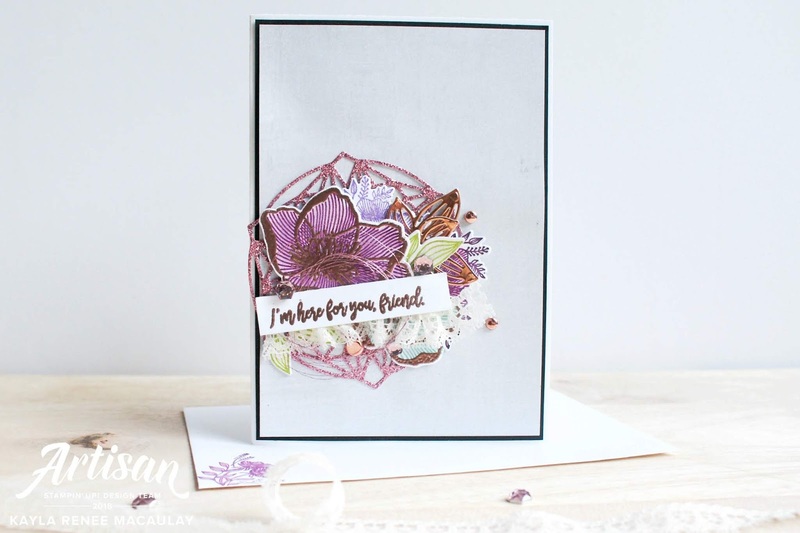 Now I'd love you to hop along and check out the amazing Kim McGillis's gorgeous blog and see below for links to the rest of the Artisan Blogs.